Flagrant food fawning: It's A Winner! We first tried this cupcake at the Magnolia Square Market and it was such a taste sensation that we had to go back for another one. Of course, then I had to get my mitts on Jennifer Graham's recipe from The Crabapple Bakery Cookbook (thanks largely to elmo's impulsiveness - I'm too much of an um-er and and ah-er /do-I-need-it? do-I_really_need-it? type). Fortunately, a home made batch doesn't disappoint (objective opinions also garnered ;p ). This delicious cake has a lovely texture and is perfectly combined with the sharp sweetness of the caramel frosting; your tastebuds will thank you! Another lovely thing about Graham's recipes is that the ingredients are listed in the order to be used - it made a world of difference. And there are tips for best ingredients and how to decorate, which is often the most time consuming part! If Graham takes this much care in presenting the details of her recipes, I'm guessing that the other creations in her book will be just as rewarding as this 'eat dessert first' cake. As promised, here's the recipe below - comments in square brackets are my additions. Love to hear how you go and what you think! Put dates and water into a heavy based saucepan. Bring to the boil over a medium to high heat, stirring continuously. Remove from heat and add ginger and bicarbonate of soda. Stir well until combined.Let mixture cool to room temperature. Preheat oven to 180 degrees C. Line three 12-hole muffin trays with 26 cupcake cases [this number may vary depending on the size of the paper cases]. Sift together self-raising flour, ground cloves and mixed spice. In a separate bowl, cream the butter for 1-2 minutes. Add half the castor sugar and beat for 2 minutes. Add remaining castor sugar and beat for 2 minutes or until the mixture is light and fluffy and the sugar has almost dissolved. Add eggs one at a time, beating for 1 minute after each addition or until the mixture is light and fluffy. Use a rubber spatula to fold in the flour mixture until well combined [this will seem harder than your regular cupcake mixture at this point - but don't fret!]. Fold in the cooled date mixture until thoroughly combined. Spoon mixture into cupcake cases, filling to three-quarters full. Bake for 20 minutes or until a fine skewer comes out clean. Remove cupcakes from trays immediately and cool on a wire rack for 30 minutes before frosting. Combine the butter, sugar, golden syrup and cream in a heavy-based saucepan over medium heat. Stir occasionally with wooden spoon until sugar has dissolved. Turn up heat to high and boil for at least 5 minutes. Take off heat and cool to room temperature. Add half of the sifted icing sugar to the cooled caramel mixture and use an electric mixer on medium speed to beat for 3 minutes or until the mixture is light and fluffy. Add the remaining icing sugar and beat for a further 3 minutes or until the mixture is light and fluffy and of a spreadable consistency. Add extra cream if the mixture is too dry or extra icing sugar if the mixture is too wet.This can be used immediately. aaw .... those cupcakes seriously look like the ones out of the book!! and i agree, isn't it helpful how she lists the ingredients in the order they're used - sounds so obvious but it's such a big help! thanks heaps jfox! like you i've been dithering a bit about whether i really need another cook book and hence haven't gotten around to buying graham's book yet. i'm going to give these little beauties a go one of these days and probably then go out and buy the book anyway. these look absolutely splendid!!!! Thanks for the recipe. I've printed out the recipe and now just need to find time to make it. It's second it line behind M's Nemesis' Galaktoboureko which I will make this week. The icing looks quite good in terms of styling. Not quite as polished a finish as the ones that you had bought, but the colour and consistency look good. hi thanh> well, m's galaktoboureko is definitely a winner! let us know how you go with the cupcakes! JFox, I'm about to buy the ingredients for making this cupcake. Then when I read it properly, the dates used doesn't specify dried. Does this mean I have to go find fresh dates? I don't think I've ever seen fresh dates? I made these last night from your posted recipe. The cakes worked a treat but I had huge problems with the icing. Any ideas where you can go wrong, cause it seems pretty simple. I ended up making a caramel sauce and everyone still oohed and aahed but I'd really like to master that icing for next time. hi thanh> i just used dried dates from the supermarket. next time though i want to try fresh ones! hi kelly> thank you for visiting, great to hear the cakes went well! it seems this icing is a bit problematic, you're not alone ;) i'm not sure where you had trouble, but i can tell you how my mates went. from friends' recent experiences, they used half the amount of icing sugar (4C rather than 8C). this makes the frosting much more caramelly, quite nice! 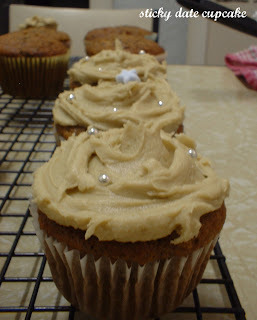 when i made the frosting, i deviated from the recipe and added the cream just as the caramel/toffee was cooling. this is a bit dangerous as the toffee can become hard quite quickly, however i found that this made the mixture much easier to beat and therefore much easier to incorporate all that icing sugar. my oven is out of action at the moment (the door won't close... i'm so sad, kelly!) but i want to try this again as i have had a few questions about the icing.. i'll let you know how i go!